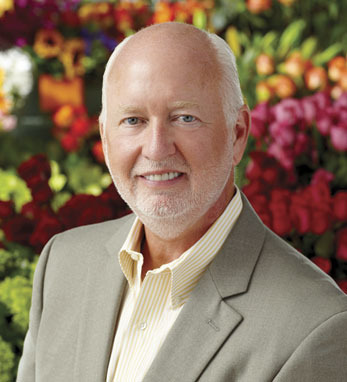 When Jim McCann founded 1-800-Flowers in 1976, people told him that he couldn’t change customers’ purchase behaviors. Luckily, McCann did not listen to them, or he would not now be president and CEO of a company with annual revenues of almost $1 billion. McCann started his company with a single flower shop over 30 years ago in addition to his regular job as a social worker. He eventually expanded it to a regional chain in the New York area. 1-800-Flowers.com was one of the first online retailers. Customers can send a wide variety of floral products by clicking a mouse on a personal computer, walking into one of its stores, or by dialing 1-800-FLOWERS. McCann is a third-generation Irish-American with roots in Counties Armagh and Limerick. He credits his love of storytelling to his Irish heritage, and has three books to his name including Stop and Sell the Roses, published in 1998. His most recent book, A Year Full of Flowers, was co-authored with his sister Julie Mulligan. McCann is married with three children.